While diving off the The East Coast of Florida back in 1977 on a Spanish wreck that sank in a hurricane in 1715, I found this piece of pottery. According to the magazine article they believed it was Kang Hsi. The only thing that I have is a piece of a cup that has traveled along way to get here. I was wondering if you could tell me anything from the picture of the mark on the bottom of the cup. I am attaching a picture to this email. I am confirming your porcelain piece to be of Chinese Porcelain, made in the city of Jingdezhen, Jiangxi province and made around 1700 plus/minus 10 years. The mark in one of the Eight Precious Things. 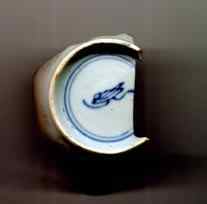 More information on this you can find on my page on Chinese Porcelain marks. Any trace of the decoration, and the exact shape of the footrim, would help to pinpoint the date of the shard more exactly.